Southern senior Austin Baker (21) hauls in a pass along the home sideline, during the Tornadoes homecoming victory on Friday in Racine, Ohio. South Gallia junior Jeffrey Sheets (center) spins between Tornado defenders, during the Rebels’ setback on Friday in Racine, Ohio. RACINE, Ohio — The Tornadoes were glad to be back on their home field, particularly the end zone areas. 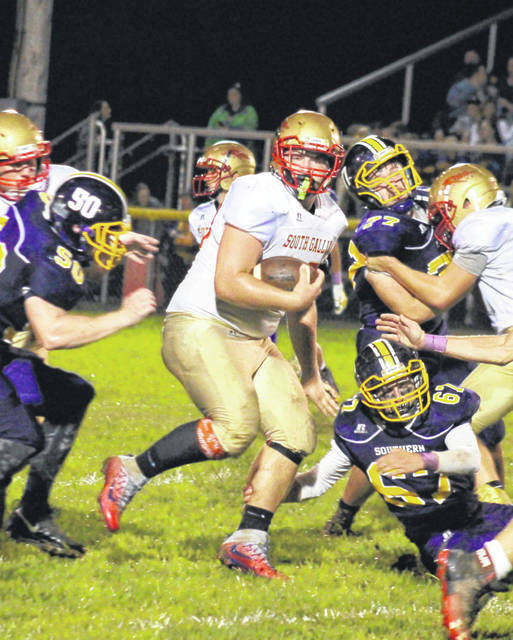 The Southern football team scored eight touchdowns in its annual homecoming game on Friday at Roger Lee Adams Memorial Field, as the Tornadoes stormed to a 54-12 victory over Tri-Valley Conference Hocking Division guest South Gallia. 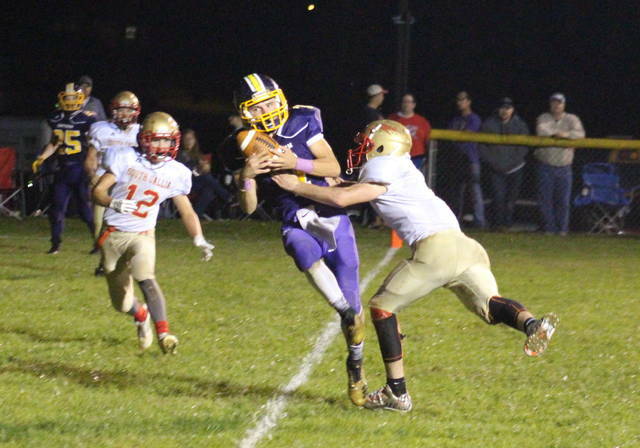 The Tornadoes (5-1, 4-1 TVC Hocking) — bouncing back from its first setback of the year — took a 6-0 lead just 1:20 into the game, as senior quarterback Logan Drummer scored on nine-yard run, capping off a six-play 57-yard drive. The Rebels (1-5, 1-4) — who’ve now dropped three straight decisions — turned the ball over on their third offensive play, and SHS senior Brody Dutton returned the interception 30 yards for a touchdown. Gage Shuler tossed a two-point conversion pass to Trey McNickle, giving the hosts a 14-0 lead with 8:45 to go in the first quarter. On the ensuing South Gallia drive, the Rebels covered 53 yards in 10 consecutive running plays, all of which gained positive yardage. SGHS senior Garrett Saunders delivered the scoring blow from 16 yards out, cutting Southern’s lead to 14-6 with 4:20 left in the period. After a three-and-out by both sides, Southern went 64 yards on three straight carries by McNickle, with the junior running back scoring from 10 yards out. Drummer made the point-after kick, stretching the SHS lead to 21-6 with 1:13 left in the first. The Rebel offense took the game into the second quarter on the next drive, and covered 76 yards in a dozen consecutive carries. SGHS junior Kyle Northup found the end zone on a nine-yard run with 7:40 to go in the half, trimming the Tornado advantage to 21-12. On the seventh play Southern’s next drive, Drummer connected with McNickle for a 53-yard scoring pass. Drummer’s extra point made the margin 28-12 with 5:00 left in the half. Next, South Gallia made it to the Tornadoes side of the field, but was lost possession on downs with 1:27 left in the half. Southern needed two plays and 17 seconds to extend its lead to 34-12, with Drummer finding Shuler for a 16-yard scoring pass. After the half, the Rebels were forced to punt on their first possession, but the snap was long and Southern took over on downs the SGHS 25. The Tornadoes’ first play of the second half was a 25-yard touchdown run by McNickle, making Southern’s lead 40-12. The Tornado lead grew to 48-12 with 48 seconds left in the third, as Drummer scored on a 37-yard run, and Shuler threw the two-point conversion to McNickle. Southern recovered a fumble on the ensuing kickoff, and three plays later, McNickle found paydirt on a three-yard run to make the final score of 54-12. Following the game, first-year Tornadoes head coach Cassady Willford was proud of the way his team stuck together through a long week. “You know what I liked about this game, our team didn’t come unraveled,” Willford said. “We had a rainy, muddy week of practice, but we pushed through it. Our guys believe in the system, they believe in what the coaches are saying and we’re getting back on track. These guys didn’t crumble, they played their hearts out tonight. For the game, Southern held a 284-to-192 advantage in total offense, including 135-to-5 through the air. 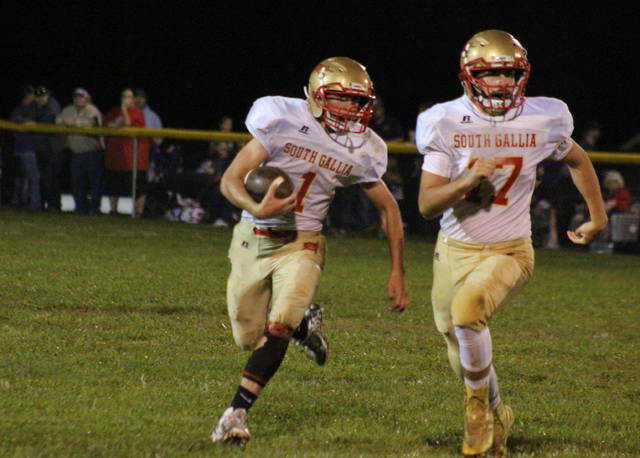 South Gallia claimed a 16-to-13 edge in first downs and a 187-to-149 advantage in rushing yards. The Rebels were penalized five times for 36 yards, while the hosts were flagged twice for a total of 10 yards. SHS fumbled five times, but recovered all-5, while SGHS lost half of its four fumbles. Second-year Rebels head coach Mike Smith acknowledged that his team committed too many errors to come out on top, but was still happy with the effort of his younger players. McNickle led the Southern offense, carrying the ball 13 times for 154 yards and three touchdowns, while catching three passes for 69 yards and another score. Drummer carried the ball four times for 44 yards and two touchdowns, while completing 7-of-11 passes for 135 yards and a pair of scores. 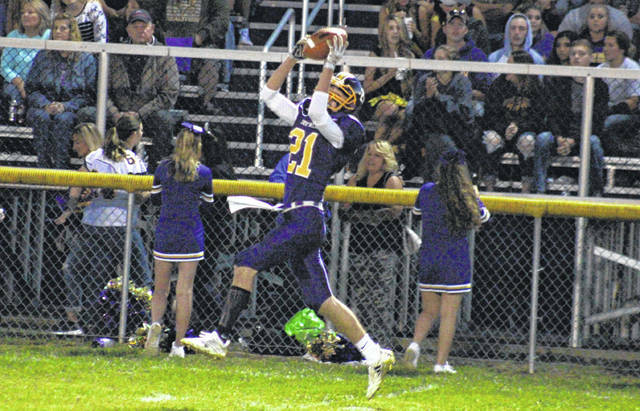 SHS senior Austin Baker caught two passes for 39 yards and a touchdown, Shuler hauled in one 16-yard touchdown pass, while Dutton caught one 11-yard touchdown. Northup led the Rebel offense with 69 yards and a touchdown on 21 carries, to go with 15 yards on a pair of receptions. Saunders had 51 yards and a score on nine carries, Gavin Bevan added 43 yards on 13 totes, while Jeffrey Sheets had 30 yards on nine rushes. SGHS freshman Tristan Saber was 4-of-6 passing for five yards, while rushing three times for three yards. Jacob Birtcher had one seven-yard rush in the setback. The Tornadoes have defeated South Gallia in three straight bouts and are now 13-9 in all-time meetings, including 6-3 in TVC Hocking play. South Gallia returns to Mercerville next week, as they host Belpre. The Tornadoes head to Ravenswood for a non-conference bout and the Wendy’s Friday Night Rivals Game of the Week on WCHS-TV.